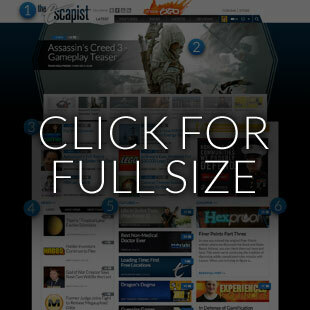 Check out The Escapist's Updated Layout! If you recall, a few months ago we announced the beginning of an ongoing redesign process. Since then we've listened very carefully to all of your feedback about what worked for you and what didn't. We've also paid very close attention to how you're navigating and making use of the website, and have made many tweaks along the way to reflect that. While we weren't able to implement all of your suggestions, we did change the areas that you asked about the most. The result will hopefully be a website that shows you more of what you want and in a more accessible way. 1. At the top of the page, you'll find our redesigned navigational bar, containing separate menus for features, news, videos, and reviews. This bar will stay at the top of the page no matter where you are on the site, ready to help you find the content you're looking for, faster. From here you can also access your profile information, including the comments you've posted, the badges you've earned, and the friends you've made at The Escapist. 2. Below the nav-bar you'll find our new giant header, an easy-to-read display that delivers our top content in a simple-to-use format. Hover your mouse over the smaller images in the horizontal menu below the header to bring that post into full view above, or you can simply watch as the site automatically cycles through your favorite videos, reviews, and all the other hot content that you're looking for. 3. Underneath the header, we've also placed a static grid of our most popular posts, from breaking news to the latest episodes of our comics and video series. 4. The rest of our homepage, found below, is now split into three, simple, vertical columns, each focusing on a different style of rolling content. To the left, you'll find the latest news, constantly updating throughout the day. By default, this column will display stories chronologically, but you'll also be able to sort them by view count or comments if you'd like to see what people are talking about. 5. To the right of news, our center column will roll out feature content: videos, like the latest episode of Zero Punctuation or Escape to the Movies; editorial content, like our popular gaming features or the newest Critical Miss; and, of course, The Escapist's own written and video reviews. 6. The column to the far right will house your favorite regular columns, such as Extra Punctuation, Experienced Points and Hexproof. We've got some big plans for the future of this section, but can't reveal it all just yet, so stay tuned in the coming months to find out more! 7. 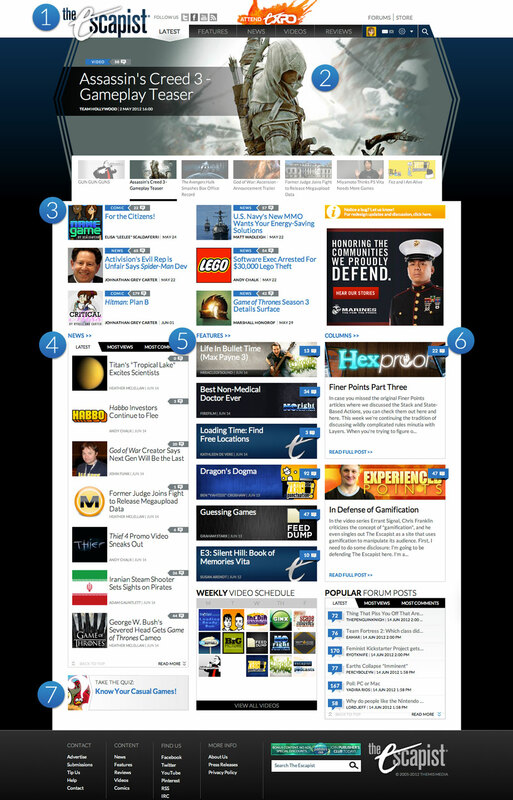 Finally, at the very bottom of the page, you'll find things like our latest quiz and the most popular forum posts. We've also introduced a new weekly schedule of our most popular series, to help you keep track of when to tune in. You'll be able to access older episodes that you may have missed, making sure that you're up to date on your favorite content. We hope that these changes will help make The Escapist easier to use and more fun for you to visit. As always, we greatly appreciate your feedback and your help with this ongoing endeavor. Please let us know what you think.